When I'm watching wildlife I always have the camera ready to take pictures. When possible, if I'm safe from harm, I'm looking at the wildlife through the camera. Always ready to take the picture I don't want to miss, things happen fast and I don't want to be distracted when seconds count. With the mother near, the cubs were busy playing, and I was busy deciding which cub to follow with my camera. In the end, I kept going back and forth through the camera between the two cubs. For this picture I had a few seconds to get it, the cubs were not interested in staying in one place, they were play fighting or rolling around on the ground. As soon as I got this cub in focus between the blades of grass, I took the picture. Following their mom, always near her for safety. About a month to go and some bears will start getting ready for the long winter nap. They are busy trying to gain weight, the more they gain the better chance they have getting through the coming winter. For the mother of these cubs, she also have to make sure there is enough food for her cubs. We are creatures of habit and wildlife are no different. I came across this medium size black bear, brown in colour, walking and stopping to get a mouthful as he went along. From past experience I had a sense what route he would be taking, I went ahead and waited for him with the window down. I could not see him, but I could see the shrubs moving as he passed by them and on occasion the sounds he made when touching the shrubs. With no one else in the area, the chances were good he was heading toward me. The hope was when he went up the short incline near me, he would see me and give me a quick look before passing by me. My goal was to have the camera focused on his face and get a picture of him looking toward the camera. That evening it played out just as I hoped. Middle of the day in the forest this grizzly mother and her two cubs walking, searching for food. Stopping to dig for roots, eating berries they came across and other vegetation. 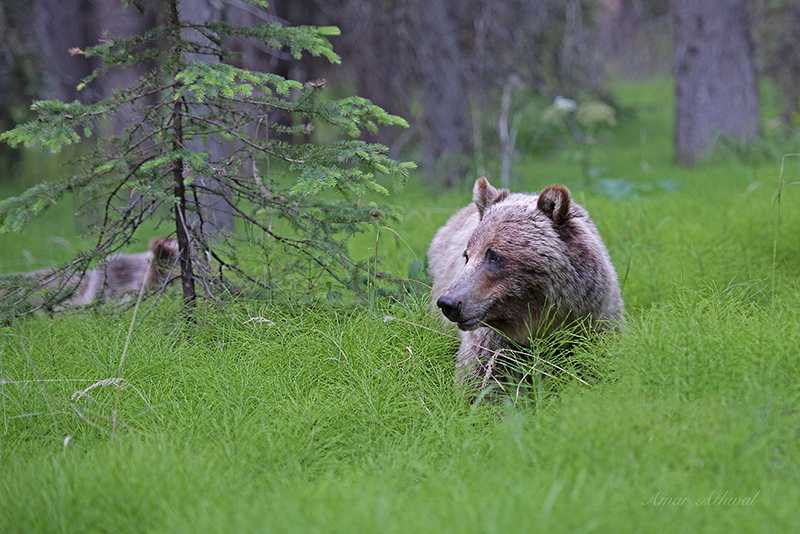 With no threat in the area, the cubs often lingered behind their mom, playing and eating. 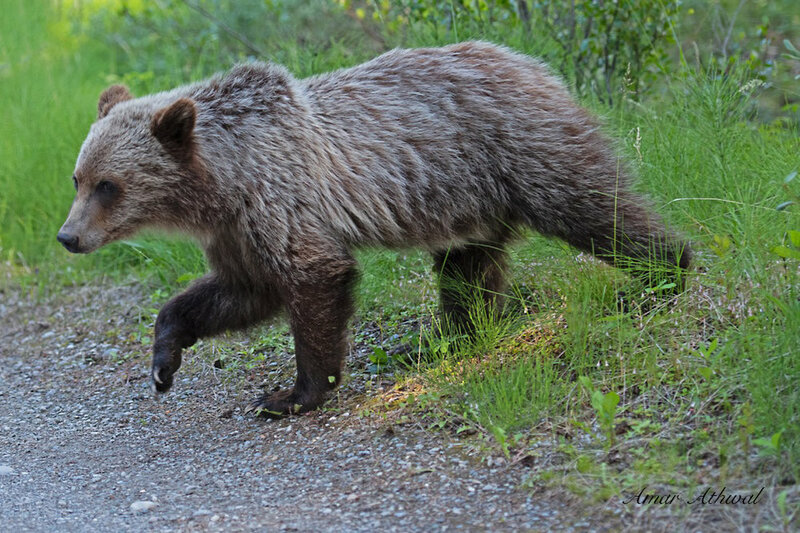 Large male grizzly spotted walking near the edge of the forest. Bears at this time are spread out, searching for food. They have about two months to go before some will start looking to go to sleep. Not much food can be found bottom of the valleys, higher up in the meadows where food comes later, are places where the bears are searching. Adding on weight to survive the coming winter, half pregnant females adding on weight to be able to give birth in January. Shepherd canadensis are their official name, but also called buffalo berry, soapberry, and by a few other names. The plant has edible berries, usually in red, but also seen in yellow and orange colours. Found across Canada, the shrub grows from a meter to two meters tall, grows in dry to moist woods, on sandy, rocky and in gravelly soils. Out here it blooms in May to June and the berries ripen in July. Elk, deer and bighorn sheep consume the leaves, while some birds and mammals eat the berries. The later includes both the brown and the black bear. Six month old grizzly cub, enjoying its first summer. Every day is a new challenge, everyday security provided by it's mother. It will spend 3 to 4 years with its mother, learning what to eat and how to be safe. This kid was just few weeks old when the picture was taken. Getting to spend sometime near the bottom of the valley, with its mother nearby. Most of its time will be spent much higher up, where it's safe from most predators. 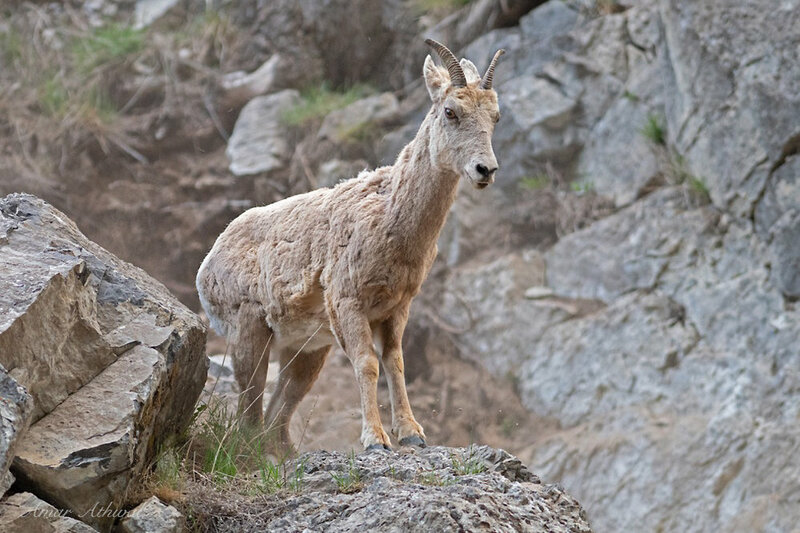 In wildlife for many species, including for the mountain goats, the female looks after their young from the day they are born to the day they are on their own. The nanny will give birth away from others, when the kid can get around the two will seek the company of others. The kid will never be too far from the nanny. The nanny will help the kid with food, help it learn to climb, nanny using their eyes to help guide the kid through a safe route on a side of a mountain. So the least a kid can do is provide it's mother a place to rest her head for a few seconds on a hot day. A beautiful morning, watching a mother grizzly and her two cubs, one next to her and the other just outside the frame. 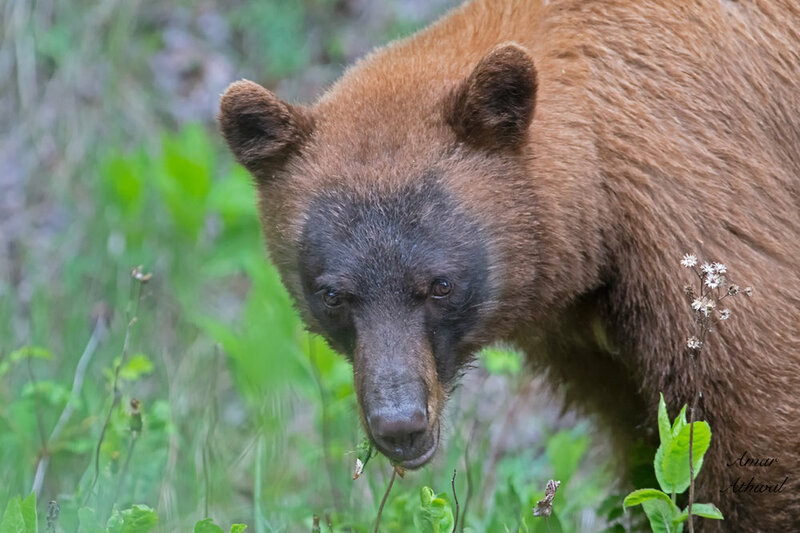 Most living in the mountains or visiting, have sighting of grizzlies on the top of their list of wildlife they want to see. It's one of the often asked questions on social media or face to face, where can they go to see bears. The answer will often disappoint them, which is "get out as much as you can'. There are other factors, look for them from May to October, take the slower speed routes and drive at the speed limit so your eyes can see more around you, but these and other factors play a smaller role. Get out and explore as much as possible. It's very rare I'll be out looking just for bears, I like to get out and explore and from experience I know I'll have more than my share of bear sightings. Nature is a pretty amazing, but it will never show you everything all at once, the more you get out the more it will show you. Lot of people if not all want to see bears, the way to do it is no secret. The main way to see more bears is to get out more. This year I have been lucky enough to come across few large black bear. This male for hundred meters or so came out of the forest and walked on the road, a very confident male took his time as he walked in the open before heading back into the trees. A picture of a bull elk taken few weeks back, busy eating in the Bow Valley. Busy gaining weight and growing its antlers for the rut season that will start in late August. This one year old grizzly, showing more independence but still not too far from its mother. After realizing his mother and sibling had moved on, it quickly covered the distance. 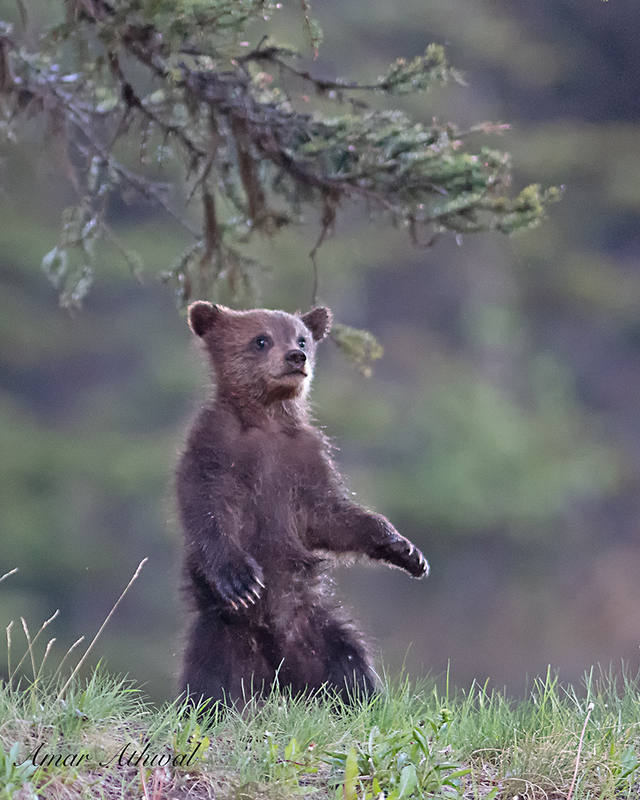 Just like the adults, this four and a half month old grizzly cub standing up to get a better look. The black bear comes in a few other colours than black, this one was light cinnamon with a black face. The life cycle of a plastic bottle. The oil that is extracted from the ground is cleaned at the refinery and then at the plastic factory the oil is transformed into plastic pellets, followed by bottle pre-forms. The pre-forms are shaped into bottles and then filled with water, which end up in the stores. From there the water is purchased and consumed, most empty bottles ends up at the landfills, some are recycled and few are thrown out as litter. Still a lot of work needed to not use plastic when possible, recycle when used and not litter at all. This grizzly mother may only find water in the plastic bottle, but the plastic can still harm her mouth and the bad habit was quickly picked up by her cubs. All wildlife need from us is a space to call home. This ewe and other Bighorn Sheep were moving along the valley, then one by one they started climbing, in few seconds this female was twenty meters above me looking down, the dust still settling. A good skill to have when trying to get away from predators. Black Bear claws are adapted for them to easily climb trees, cubs right out of the den they are ready and capable. Unlike the long claws of the grizzly bears, the black bears have sharp, shorter and curved claws, perfect for climbing trees to get away from predators, a place to sleep, rest or to find food. Two black bears can get into a fight on a tree, the advantage would be for the bear below, the upper bear can't fight face to face and when bears do climb down, their bottom has to be facing the bottom. In the case of this picture, the cubs were sleeping on the tree while their mother was feeding below. She climbed up the tree and woke up her cubs, the sleepy heads one by one climbed down.